Sure, Lovemarks is food for thought. The concept isn't hard to understand, but it's much harder to build into a product. It's a by-product of hard work from various angles of the company...customer service, user experience, and product design among other factors. As an Ad-agency creative type, he may be in love with the visuals just like we like fine art. But is he qualified on how to make a lovemark? I haven't read the book, so I can't assume or criticize. Although I do acknowledge the power of great advertising in arousing interest and generating great sales...the aforementioned factors are the strongest influencers to the longevity of Lovemarks. lovemarks (indeed a clumsy term for a good observation) has to be embedded in the core of a company / brand's offer. The days of bad products or services being able to be disguised behind clever advertising are long gone. So lovemarks HAVE to start with the product, and it's viable and aspirational to hope for your ad agency to do just that. There are many examples of transcended brands (Apple, which you cited, being at the forefront) but this comes directly from the fusion of creativity, innovation, heart and soul into the design of their products. Saatchi will never become a lovemark because it's a business selling a service to other businesses, and they will always put numbers (i.e. their head) before their heart. Would a client of Saatchi's remain as such if they were seeing poor returns on their investment? Hardly. I don't think brands that primarily do business with other businesses can become true lovemarks. The hope for Saatchi is to develop campaigns that are so refreshing, original, real, open and transparent that the consumers being targeted say "Hey, that's a great ad - it's clever, witty, original and isn't trying to pull the wool over my eyes". But therein lies the conflict - between the creator of the campaign (Saatchi) and the "owner" of it (their client). He's got a job to do which involves turning around an advertising agency that was in trouble. And he created a pretty good tool for doing that didn't he? Heck, we're all talking about them! "According to Roberts, when brands earn respect and love from customers, they can forge loyalty beyond reason. And when that happens, brands transcend from being just a brand … into being a Lovemark." I haven't read the book, but I find no falsity in the above statement. Now, if Roberts is claiming advertising leads to brand loyalty beyond reason, I can confidently say he is wrong. As you know and have experienced, John, brands grow from the inside/out. mvellandi ... indeed, a "Lovemark" is an output and not a collection of inputs. Asi ... yep, a "Lovemark" has more to do with the culture and mission of the company than it has to do with marketing/branding/advertising campaigns. As Spike Jones says, its about Movements, not Campaigns. David … Roberts does a great job of stoking conversation. And, this conversation of companies needing to build a respected brand just to enter the party versus companies building a beloved brand which become the life of the party is something every marketer should talk about. Lewis … Roberts takes a broader view of building Lovemarks where advertising plays a role in creating "Mystery, Sensuality, and Intimacy" with customers. But he says RESPECT must come first. To gauge if a company has earned the RESPECT of its customer, he lists 12 tough questions to ask. Such questions include : (#3) Does your brand have a heritage that consumers know and care about? (#8) Does the way consumers perceive your brand match the reality? (#9) Would you recommend your brand to your best friend? (#12) Does your company keep its promises, even if it might hurt the bottom line? 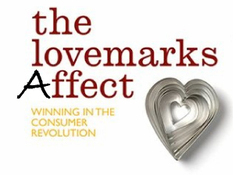 Where I think lots of marketers, including me, get agitated with the Lovemarks message is in how Roberts delivers it. As I wrote in my review for 800-CEO-READ of the first Lovemarks book, there’s thick advertising agency varnish to how the Lovemarks message is presented. It feels like a capabilities pitch deck. And now we know, from the above mentioned Ad Age article, that the Lovemarks books are essentially Saatchi & Saatchi’s capabilities pitch decks. I really believe that with Lovemark Saatchi and Saatchi shows how irrelevant they have become.. It is about delivering great product experiences.. Create great reputation. Transparancy.. Why would I hire an ad agency for this? All I can say is that when I emailed Mr. Roberts a comment and a question about his book, I got a nice note back from him on the same day. This says a lot more than most are willing to do. I contacted him too recently but have yet to receive any reply. Yes, there is some agency varnish, but why shouldn't there be? While not all the ideas are necessarily original re: emotional branding, I respect him highly for the fact that he has wrapped it all up and called it "Love" marks. It is easy to talk but not so easy to get up and present a pitch to a client that is all about "Love". You have to cop a lot of smirks and eye-rolling. Even before that you need to change the attitude of the people around you to believe in "Love". And I think calling it by any lesser name (as some may choose to) doesn't do it justice. I can say out of personal experience that if you have the courage to live the idea of Lovemarks in your life and your work (and it won't happen overnight), you will experience the "Lovemarks" effect. It is certainly not true that B2B relationships cannot become Lovemarks because anyone can be a Lovemark to another. Sorry if this is too much of a rant, I just feel very strongly about this topic. As advertisers/marketers, we can greatly influence the brands we work with to create "a world we love to live in".